Easiest way to create split tests on your WordPress sites, right from the content editor! Improve your website and start measuring your audience now. Perform A/B tests on your website to measure what works best for your audience. Use the results of your tests to generate more leads and conversions. Backed by statistical significance calculations. Create A/B testing right in the content editor of your pages and posts, or add them to your templates. Instantaneously see results in the admin section of WordPress. See the amount participants and conversions in one glance. Will not affect your current SEO and is built to adhere to SEO rules. Implement A/B tests without hiring a web developer. Anyone can create tests using this plugin. With A/B Testing for WordPress you can serve multiple variants of your content to your visitors. This allows you to track which version of your website will lead to more conversions. A/B Testing for WordPress will serve either version of the test variants and measures the amount of visitors who reach the goal page. Let the plugin figure out which of the variants was most popular with your audience. In the test results A/B Testing for WordPress will show you the statistical significance of your test results, so you know whether to be confident about the test results or not. Track the amount of sign ups your newsletter form generates or how many people engage with your forms. Create tests to optimise your site, and improve the use of these integrated plugins. 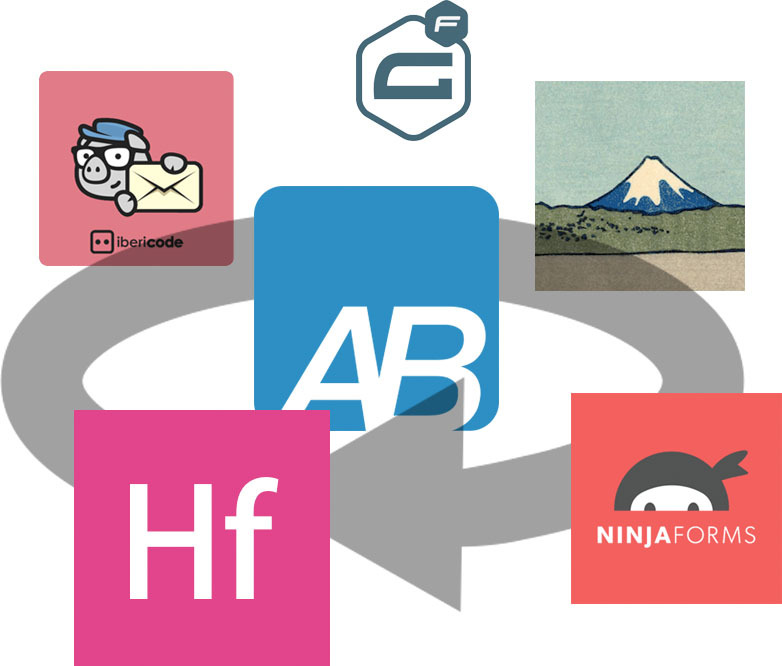 A/B Testing for WordPress integrates with WordPress plugins: Mailchimp for WordPress, HTML Forms, Contact Form 7, Gravity Forms, Formidable, Ninja Forms, WPForms. Use A/B Testing for WordPress Now! How does A/B Testing for WordPress measure tests? When a visitor sees a test variant the visitor will be logged as a participant of that variant. When the visitor visits the goal page of the test, the visitor will also be logged as a conversion of the variant. 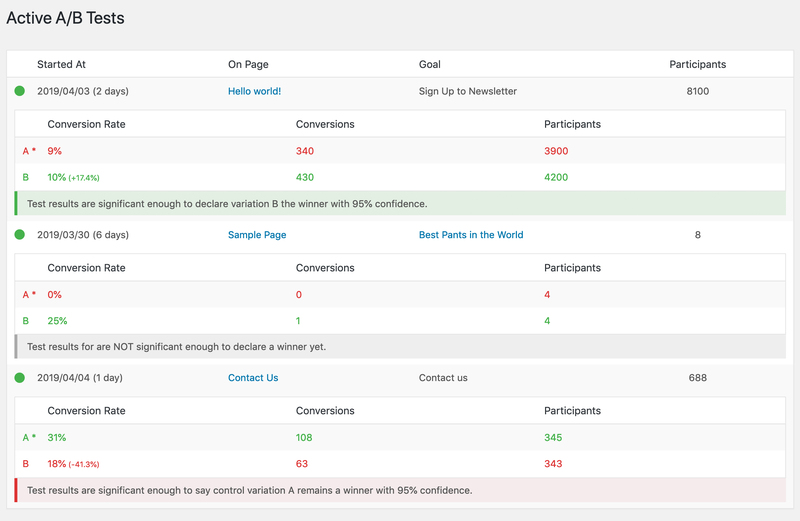 A/B Testing for WordPress will calculate the percentage of the participants who became conversions and determines a winning variant through these numbers. Does A/B Testing for WordPress affect SEO? Does A/B Testing for WordPress allow weight distribution? Yes. You can change the amount of visitors should see each variant. What does A/B Testing for WordPress count as a goal? You can pick and post or page as a goal to track. Counting outbound links or custom post types as conversion is not possible (yet). How Can I Add a Test to my Site? You can enter tests right in the content of your pages and posts through the editor. Or create a separate test which you can place anywhere on your site using a shortcode. Works with any template!